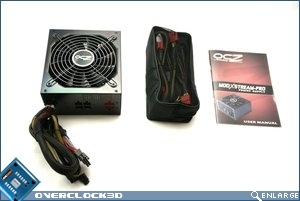 Some PSU's come in incredibly elaborate packaging, such as the Tagan Turbojet 1100w, which came in a suitcase. 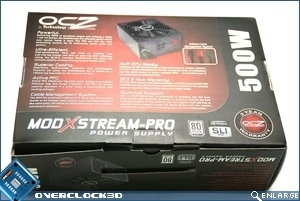 OCZ however, have chosen to keep things simple and go with an ordinary box. 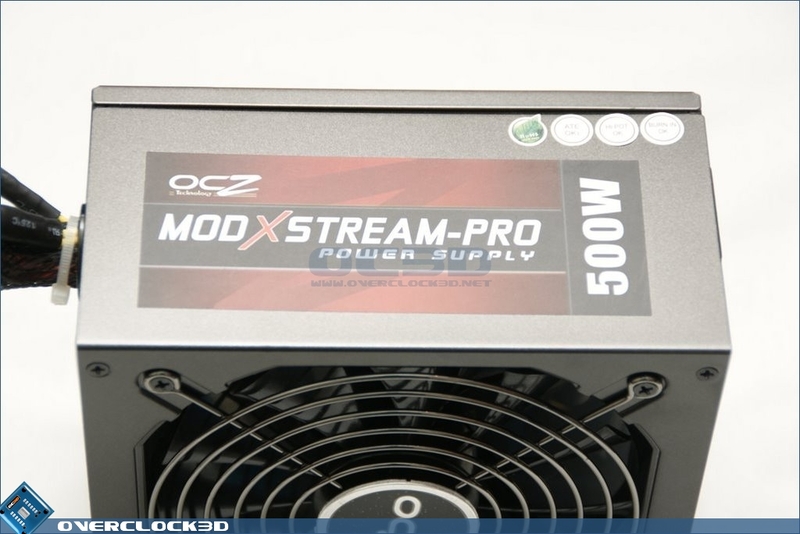 This not only keeps manufacturing costs down, but shipping as well. As you can see the packaging uses a uniform layout front and back; a swooping black area around the edges with the headline features, whilst a red section has all the smaller details. 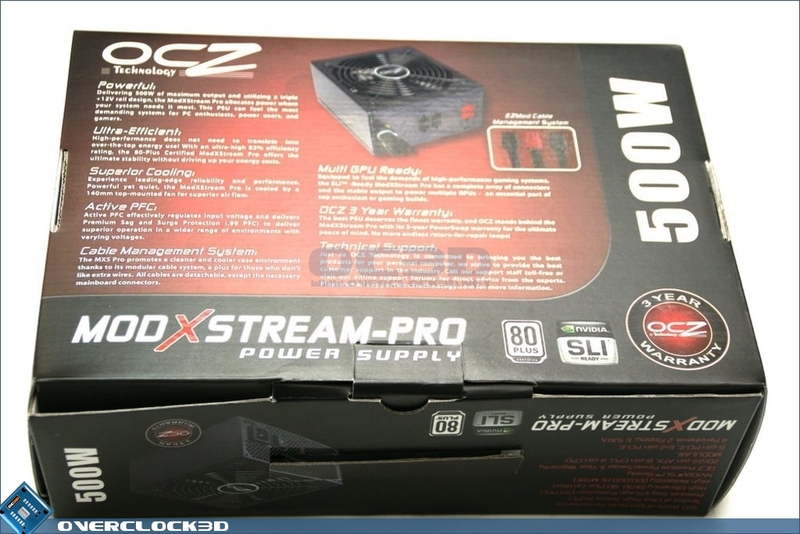 There is a picture of the front and back of the PSU on either side, and a small carry handle on the top of the box. 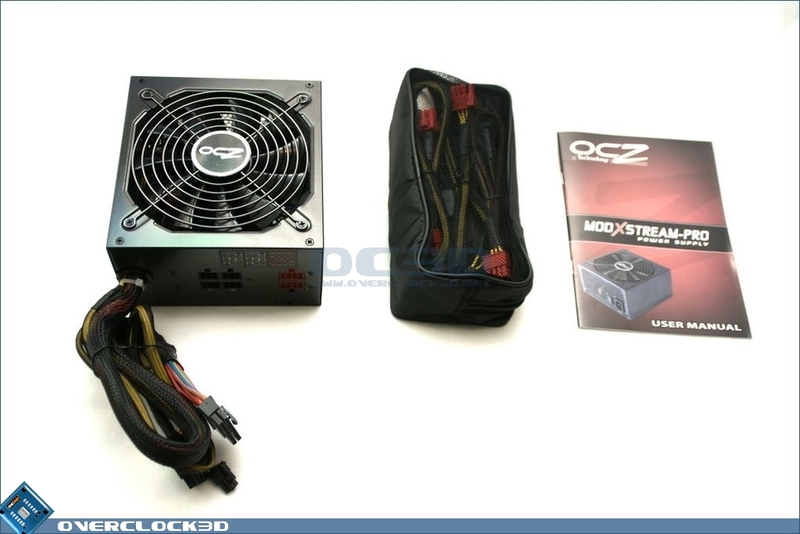 Inside the box we have: the PSU, bag of modular cables and the user manual. 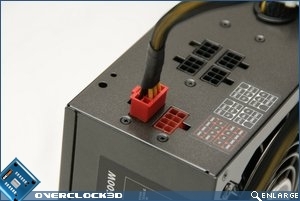 In with the modular cables is a set of screws for installation and a UK mains power lead. 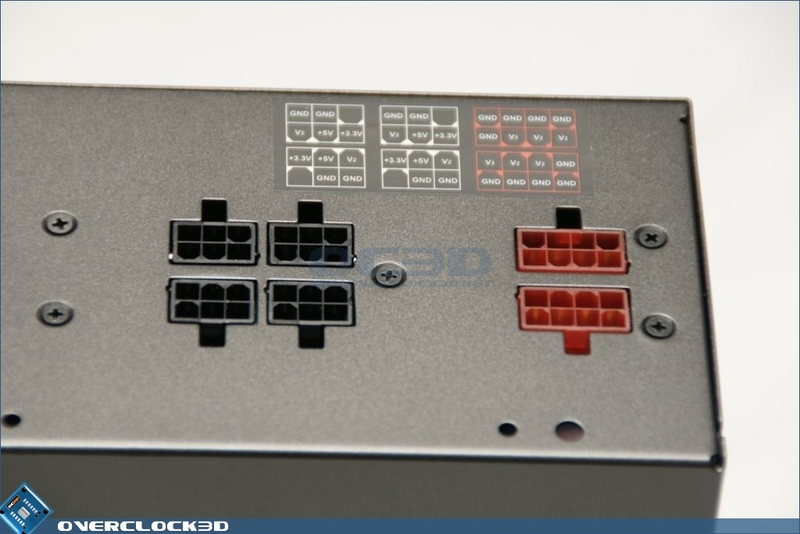 The PSU is close to gun metal grey in colour, and the paint looks nicely done. The big fan grill dominates the top of the PSU, and big fans mean less noise in most cases. So far so good.. 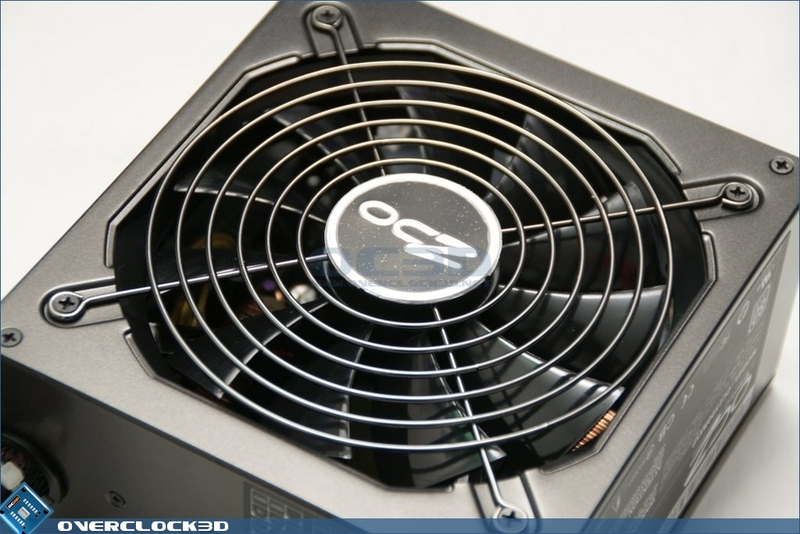 The fan grill features the OCZ logo at its centre, and looks fairly unrestrictive airflow-wise, whilst also stopping fingers and other objects from entering the insides of the PSU. 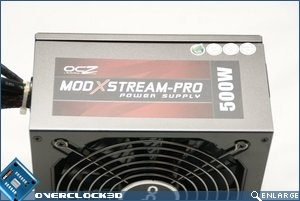 The side of the PSU has the ModXstream label, along with various other labels for certifications. 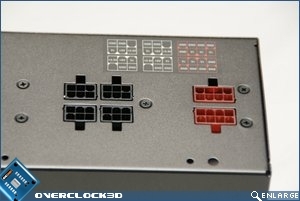 Round the back we have the modular connectors. 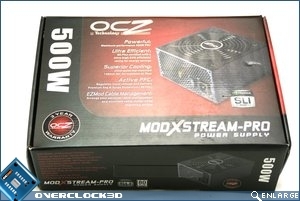 These are similar to those used on other products and use the tried and tested PCI-e style layout. 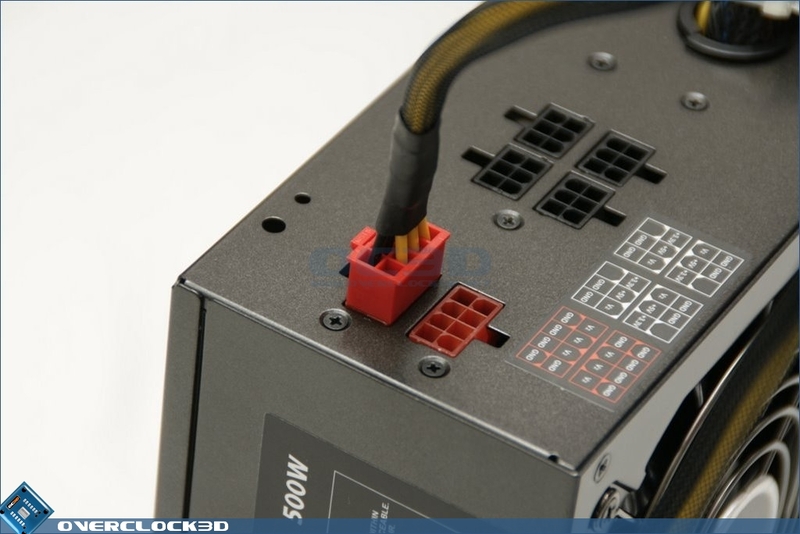 The modular leads clip in, with a little latch on top securing them in place. 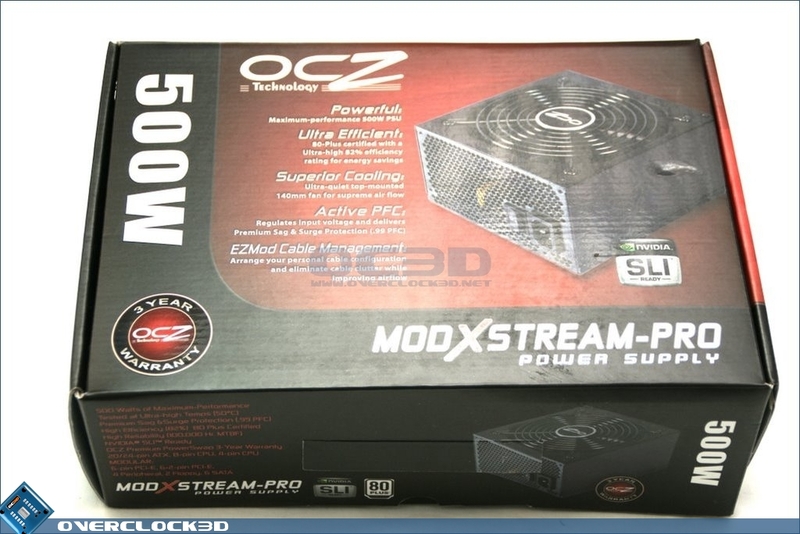 Modular leads not only reduce cable clutter making your case look nicer, but can also improve airflow, lowering overall system temperatures.